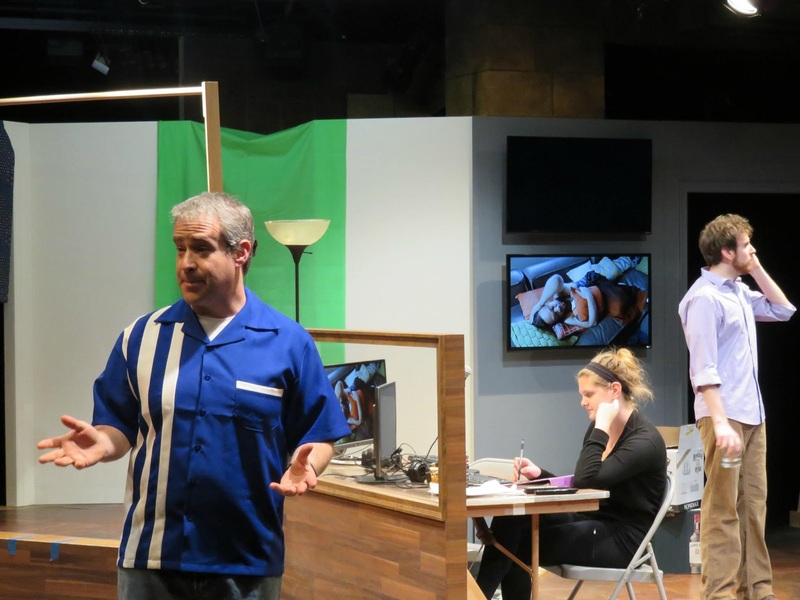 Six Characters in Search of an Author, currently playing on the Andy Boss Thrust Stage at Park Square Theater (through May 8) is a fascinating, multi-layered work of meta-theater. Alan Berks adapted this work from Luigi Pirandello's 1921 play (which you can read on the Internet, thank you Project Gutenberg!) and also directs the production. A stock company under the direction of their Manager and with the assistance of the Prompter and the Property Man is about to rehearse a play. Since there is a dearth of good French comedies, they have to fall back on a comedy by Pirandello, which, the Manager admits, is, as usual, quite incomprehensible. Just as rehearsal starts the Door Man interrupts. He is followed by a queer assortment of Characters who announce that they are looking for an author. It appears that the author whose imagination has conceived them has decided against putting them in a drama. Their only chance to live is to find some author who is willing to put them in a play. The bewildered Manager finally consents to let the Characters live out their own story on the stage, while the Prompter takes down the parts in shorthand and the stock company stands round to pick up suggestions for proper interpretation. This adaptation is set in the world of reality television, which allows Berks to comment on some of the tropes of the genre and on the artificiality of "reality" television. The play begins in the control room on the set of The Maze, a Big Brother-like tv show, which is preparing for its live finale. Playgoers are the studio audience, watching the crew prepare for the show and being coached by the host (Joe Wiener) to applaud, boo and hiss. Banks of monitors show various views of the house, as well as footage from past episodes of the show. In the midst of all this, the three remaining contestants burst into the control room, complaining about the game, the show, and each other. The Producer (Paul LaNave) tries to take back control of the proceedings without much success. Meanwhile, we gradually become aware of a strange group of people moving through the supposedly empty house--a wonderfully spooky effect. The strangers enter the control room, and everything gets a bit surreal. They identify themselves as Characters (Adam Whisner, Sandra Struthers, Kiara Jackson and Gabriel Murphy) who have been abandoned by their author and are searching for someone to help them finish their story. To explain more would be too spoilery. Suffice it to say that the Characters (who are dressed in old-fashioned clothing and kind of otherworldly make-up, but don't appear to be of any specific era) are from the Pirandello play, and their stories are appropriately (and decidedly) complicated. The beauty in this adaptation is the conceit of the Characters meeting the 'characters'--the contestants, who each fill a particular reality show niche. Rachel (Rachel Finch) is "the flirt", Sam (the wonderful and committed Sam Landman) is "the jerk," an outspoken racist/sexist stereotype. Sam's ill-informed barbs are mostly directed at "the dude," Michael (Michael T. Brown, whose frequent asides to the audience are hilarious). Although the reality show unsuccessfully tries to cast Michael as a thug, he's actually a gay, black man. I'm not sure the stereotyping has been totally averted here. There are tons of interesting observations here about the nature of "reality" television--I only wish they had been developed more fully. At points, those observations feel less like comment, and more like an excuse to have the characters behave in reprehensible ways, especially Sam. It's a very thin line to walk. Elements of the Characters' stories are doled out in bits and pieces, and are so complicated as to make the story unclear, but that seems to have been the point in the original play. It's still kind of unusual to see a work of entertainment that doesn't spell out the whole story, but it gave me and my companions plenty to discuss after the show, as we all had different interpretations of what we saw. And hurrah for plays that make the audience think! The performances by the cast were universally excellent, with the stylized portrayals of the Characters contrasting nicely with the other, more realistic, but equally dramatic, characters. Each actor plays a recognizable "type" but delves below the surface to make each player specific. No matter how confusing the plot becomes, the cast is rock-solid in maintaining each distinctive character. In addition to the work on stage, the actors had the added layer of performing in and reacting to the video from other rooms in the house, which is done seamlessly. Kudos to this talented group and Berks' direction. Wonderlust Productions updated Berks' adaptation (originally performed in 2013 at Gremlin Theatre) with input from a residency at the University of Saint Thomas, where they asked how young people in our modern society interpret some of the questions asked by the play. Wonderlust has more community-driven projects coming up, including plays about the adoption experience and about being an employee at the state capitol. I look forward to seeing more of this newish company's work, given their unique take on this classic. Check out the trailer for the play's "reality show:"